A scream rips through the carriage. “Shut the windows!” A boy yells in Burmese. “They’ve got guns!” Suddenly, the carriage erupts with squeals and everyone is thrown into a blind panic, stepping over each other in a struggle to close the windows. Moments later, the train is under siege; the carriage sways to the side as water slams up against the feeble glass. 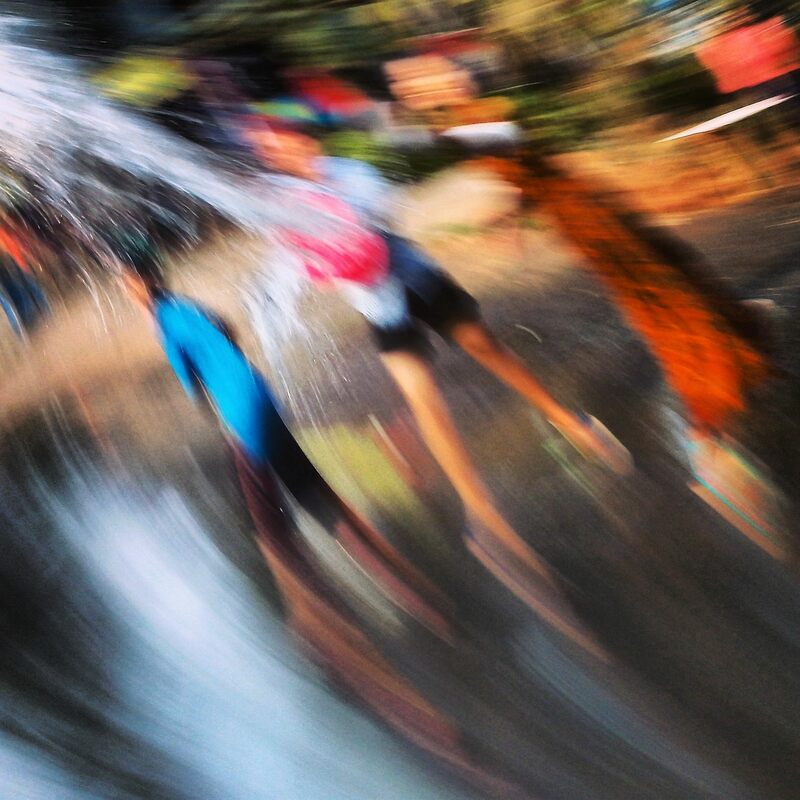 Glimpses of our assailants look up with eyes full of glee behind the barrels of plastic water guns. Today is day one of Thingyan (Burmese New Year). It marks the transition from year 1376 to 1377 on the Burmese calendar. The festival is also celebrated in neighbouring Buddhist countries around the same time – Songkran in Thailand and Laos, and Chaul Chnam Thmey in Cambodia. As well as dousing each other in water to wash away the sins and misfortunes of the previous year, it’s also common practice during this time to perform merit-making deeds, pay respect to monks and release captive fish into rivers and lakes. 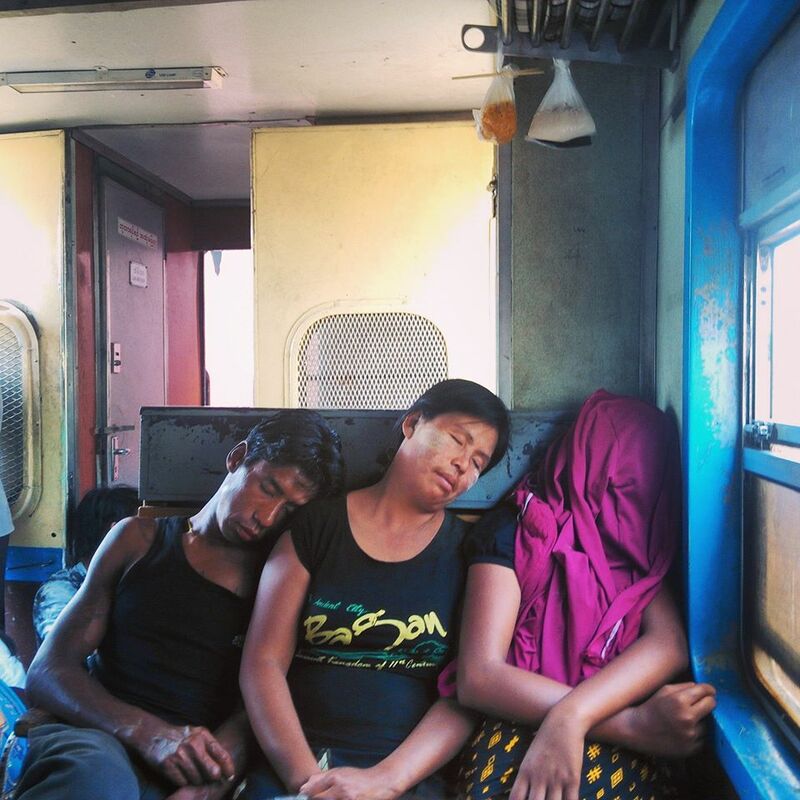 Some say Thingyan traditions are fast-fading, particularly in the cities where each year the festivals get wilder with escalating drug-use, road accidents, and sexual abuse cases. Even to consider the sheer scale of water wastage when other areas of the country suffer from serious drought, is unsettling. On the bright side though, Thingyan is a time of letting go for the Burmese people and the festival is marked by a fierce and unrelenting optimism for the year ahead. 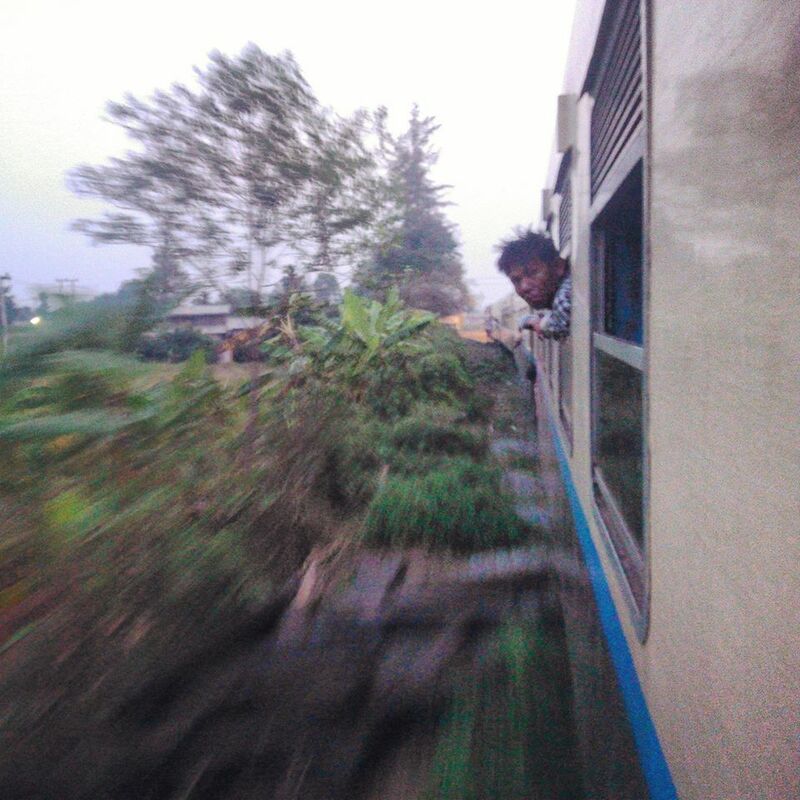 So there we were on the first day of the festival, traveling 12 hours by train to Mandalay. The women sat fanning themselves as we crammed four-by-four on the wooden seats in forty degree heat. 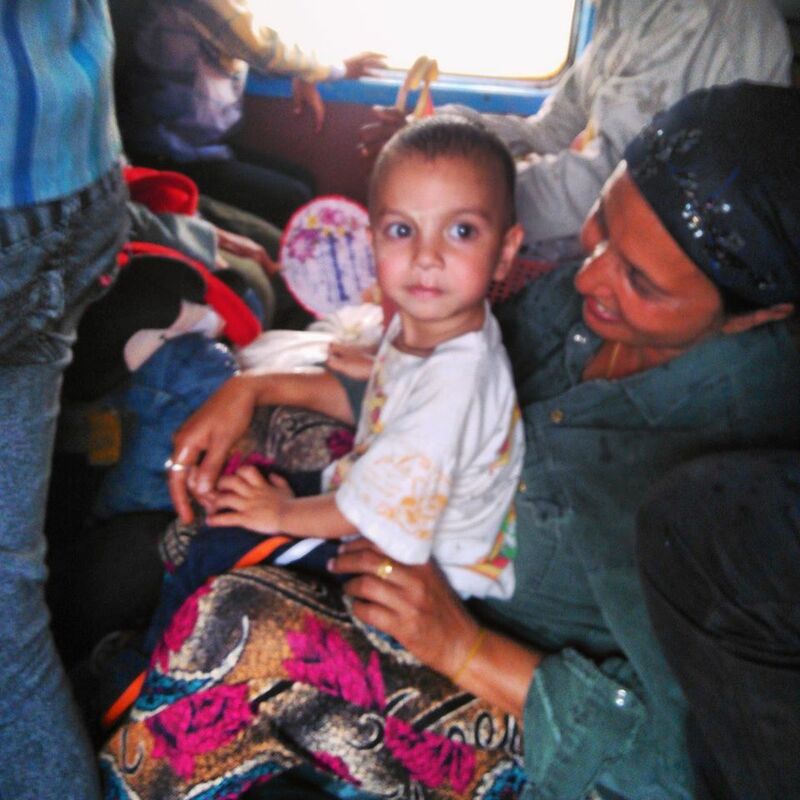 Whenever we reached a town, both kids and adults ran alongside the train with liquid ammunition aimed for the open windows. In the rural towns, the passing trains were the big event of their day and they had prepared well. The inside of the train was quickly soaked from surprise attacks. 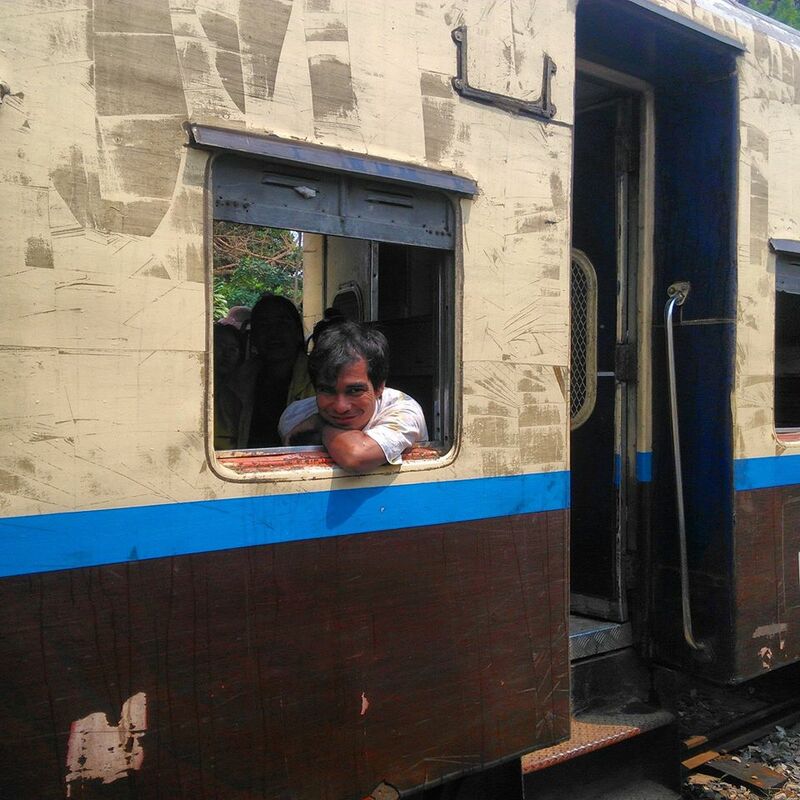 The trains in Myanmar are decrepit leftovers from the British Colony, and as much as they’re nice for tourists visiting Burma, we can’t expect the Burmese to endure those painfully long journeys rocking to-and-fro forever on our account. One day soon they’ll have to be replaced. At one point the train bounced so high, everyone was forced to stand and trampoline a foot into the air. I watched with admiration as a woman unfazed, continued to wander through the carriage balancing a mound of quail eggs upon her head. The day passed by in snapshots; women muttering silent prayers to far-off temples; station stops where vendors carried trays on their heads piled with platters of grilled fish heads, greasy chicken feet, sun dried shrimps etc. and you just reached a hand out of the open window and picked whatever you desired; rolling into pitch-dark cave tunnels and crossing the famous Goteik Viaduct, that was described by Paul Theroux as a bizarre “monster of silver geometry” amid the ragged rock and jungle. 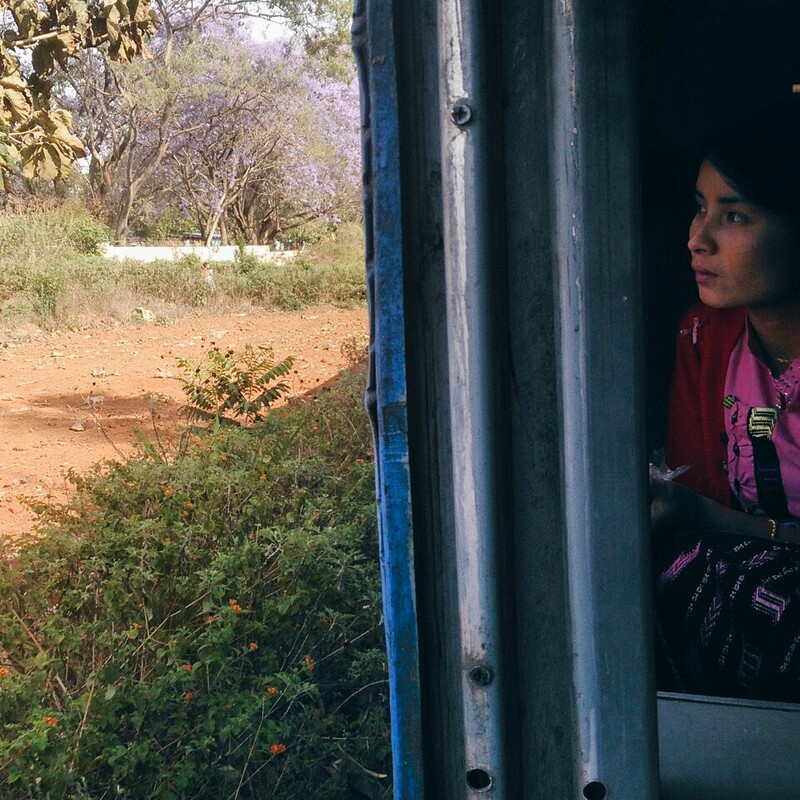 At Pyin Oo Lwin, we discovered that the train was – amazingly – running ahead of time and was going to remain a whole hour in the station. The locals seemed to have a telepathic connection with the driver, so they knew precisely how long we had at each station. We hadn’t a clue. One time the train had stopped at a red signal, and a woman hopped off and began searching for seeds under a huge violet-blossomed tree. When the whistles blew, she hitched up her longyi and ran daintily back to the train, hopping back on as it picked up speed. To pass time at Pyin Oo Lwin, people ate fried banana and corn on the tracks and threw the remains to poor street dogs, who were roaming the tracks for anything they could find. One dog was chewing miserably on a polystyrene takeout box. In Burma, you can’t help but notice how people discard their rubbish everywhere – empty whiskey bottles are flung out the windows of the moving train, along with plastic bags and cans which are casually slipped out the open doors into the jungle below… but I still felt a pang of guilt and clung onto my rubbish in the absence of bins, which was pretty much all the time. Dangerously close to departure, we stopped at a betel nut stand and each got some to try, agreeing that it was an essential part of Burmese culture. Everywhere you go you see the red-stained mouths, the toothless grins hooked on betel. The roads are covered in crimson splashes. The lady was selling the betel for 100kyat (6p) a piece, but she was feeling generous and gave them to us as ‘presents’ no matter how much we protested. “I insist,” She said, “You are my friends.” This generosity is something you find everywhere in Burma. 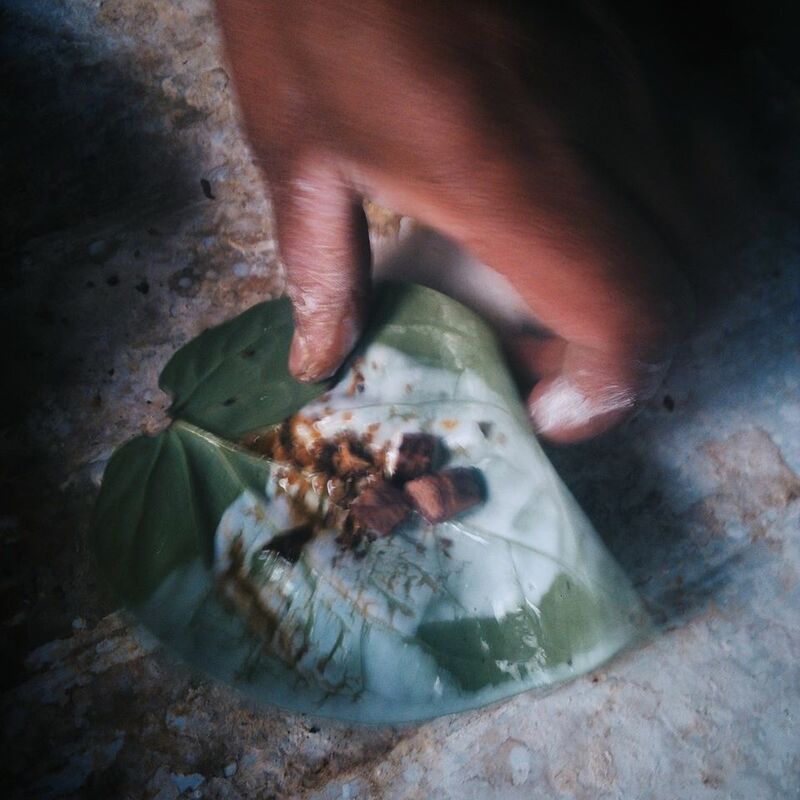 We watched as she painted the heart-shaped leaves with lime, and then sprinkled various things over: rose powder, aniseed, and other flavours that had no name. The whole time she did this, she spoke to us demonstrating the rolling art of the betel parcel, but her fingers moved too brisk to see what was happening. All along the roadside you see these 24 hour ‘power stops’, where people work under a single bulb folding betel leaves behind lime-splashed glass. News reports recently linked betel nut to oral cancer and it has been described as Burma’s deadly addiction. There was however, something compelling about this exotic stimulant. It is said to enhance your concentration but as we saw on the train, it can have the opposite effect if taken too often… One man (who coincidentally happened to be the same man that had invited me into his home the night before and introduced me to the 15 or so family members, taught me Hindi, and ordered sponge cakes to be delivered at such a late hour on motorbike) had an unlimited supply of betel in his back pocket and would be chewing incessantly, and leaning over us to spit the red juice out the window. He was missing most of his teeth, and his eyes remained half-shut as he spoke to us in slurred sentences. He wasn’t exactly a walking advert for betel. By now, the lights on the train were so dim that we could hardly make out each other’s faces. 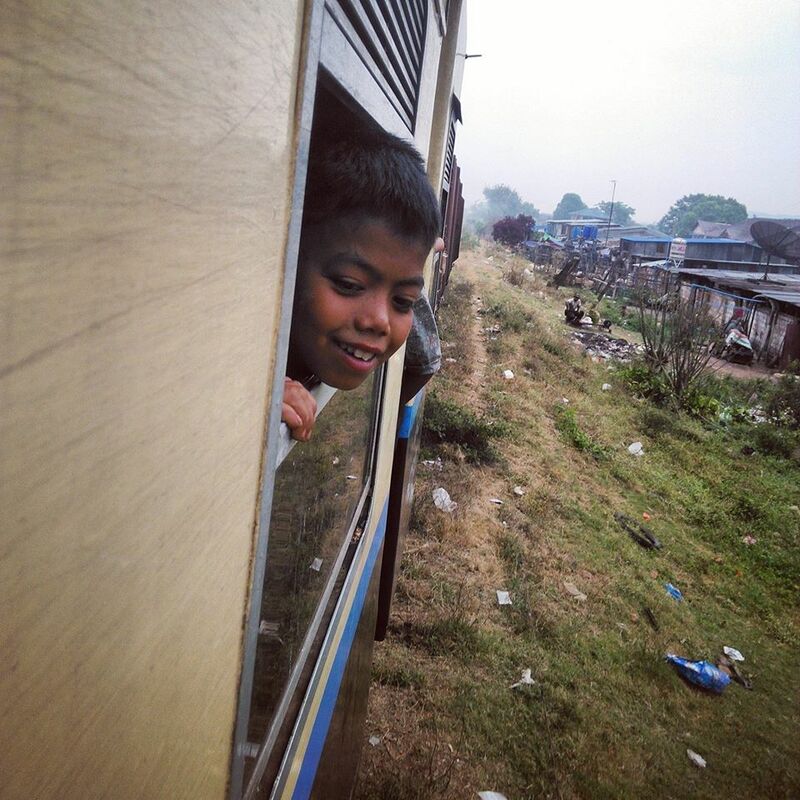 We spent the long hours playing paper games, tattooing soldiers with biro, learning Burmese, and of course sampling the betel (“Chew ‘til juice, then spit”) and there was me inwardly thinking I probably won’t try that again… As the train rattled on, teenage boys got increasingly drunk in the seats beside us and one boy had to be carried off the train by his friends at the next station. We had the windows open wide and all the bugs of the night came floating in. Isabel sang Billy Holiday songs and some Burmese girls, who were traveling with a big sack of tea leaves that they’d been struggling all day to protect from the water, finally relaxed and sang along to Jessica Black and Burmese pop music from their iPhones. Later on as the cool air blew in from the rice paddies and we chugged past tiny houses right by the rail tracks, a girl with super long hair tied in plaits put her head out window for first time in 12 hours, only to be splashed in the face with a bucketful of icy water. This was the sign that we’d reached Mandalay. Getting off the train, we felt like you always do when you arrive in a new destination: lost, tired, confused, exhilarated. There was a carriage further up full of soldiers and monks on crutches climbing awkwardly down the steps. The soldiers were unloading boxes, crates, AK-47s, and puppies onto the platform. We stayed to chat with the soldiers for a while and learnt that they were returning from the north, where wars were raging on the Chinese border. Leaving the station, I saw the same soldiers making their way home down the rail tracks with guns swinging from their shoulders. It’s funny how you can be stuck breathing the same air with the same people for 12 hours, noticing everyone’s peculiarities and getting to know them, and then at the end of the line the people disperse and they’re gone, only making fleeting impressions on your own adventure, and you realise you’ll probably never see them again. But life moves on, and I went on to meet yet more people in the weeks ahead, who displayed such astonishing acts of kindness in spite of decades of military rule and oppression, that I found it impossible not to love this beautiful country.